A little over one week ago NVIDIA committed to bringing Android Lollipop to the SHIELD Tablet before the end of November. This was fairly noteworthy, as it represents a very quick turnaround time for shipping Android updates after Google releases the source code. Today NVIDIA has made a number of additional announcements about the SHIELD Tablet, including a release date confirmation for the Android Lollipop upgrade, news about imminent expansion of their GRID game streaming service, updates to NVIDIA's stock applications, and new game titles that have been designed to work with SHIELD. The first part of the announcement is the announcement of the release date for the update to Android Lollipop. NVIDIA plans to begin the rollout of the update on Tuesday, November 18th, less than one week from today. Although NVIDIA is not the first manufacturer to begin to ship the Lollipop update, the speed at which they have done so is still extremely fast relative to how long it typically takes Android devices to receive updates. It's also impressive because NVIDIA has had to spend time updating their included applications like SHIELD Hub to follow Google's Material Design principles. In addition to the Lollipop update, NVIDIA will also be including a substantial update for their Dabbler app, bringing it to version 2.0. For users who don't know, Dabbler is a sketching application that NVIDIA makes for the SHIELD Tablet to work with the stylus. Users who are familiar with Paper by FiftyThree for iPad will have an idea of what Dabbler is, but with Dabbler 2.0 NVIDIA is bringing a substantial improvement to the application with support for multiple layers in images, along with a new Material Design appearance. The addition of layers is only a single feature, but it brings Dabbler much closer to the features we see in professional art applications. Dabbler 2.0 also brings support for Twitch streaming so users can stream their drawing sessions, allowing users to watch the sketch being created. The appeal of the SHIELD Tablet is its capability for playing games. Not just mobile games, but also a collection of PC games that NVIDIA has worked with game developers to bring over to SHIELD devices. Portal and Half Life 2 have already been available for some time now, but as you'll see above there's a new addition to the library of Valve games available for SHIELD, with Half Life 2: Episode One being made available for the platform. 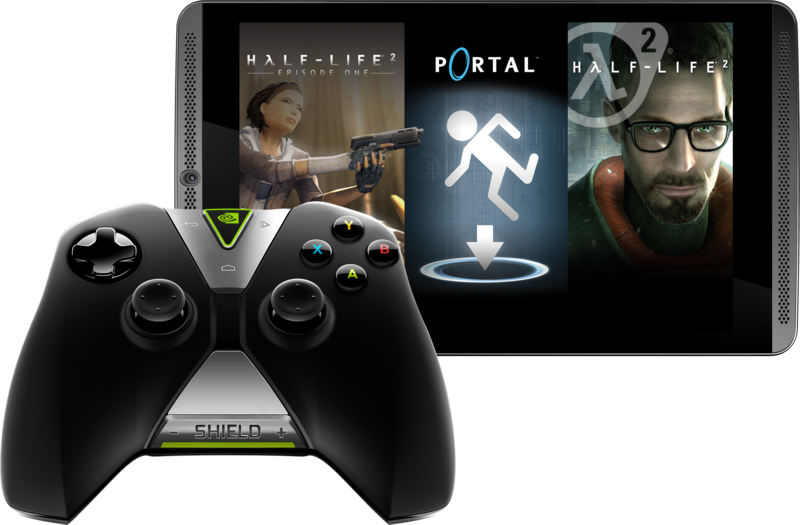 It will be available for purchase on its own to current owners, and it will also be available alongside Half Life 2 and Portal in a bundle called the Green Box, which will come free with the LTE model of the SHIELD Tablet. All that's left is to bring Half Life 2: Episode 2, and the SHIELD tablet will have all of the released titles in Valve's eternally incomplete set of episodic games. In addition to Half Life 2: Episode 1, NVIDIA is telling users to keep an eye out for three new SHIELD-optimized games that are available on Google Play. The first is OddWorld: Stranger's Wrath which is an action-adventure game. The second is Pure Pool, which allows users to play pool with high quality 3D graphics. The third and final is Strike Suit Zero which is a space combat game. The last, and possibly most exciting announcement of the day from NVIDIA, is the expansion of their GRID cloud gaming service. The idea of a cloud based service for streaming games is nothing new, and we're frequently promised that one that works well is right on the horizon, but it has remained fairly elusive. Based on the feedback from the beta that NVIDIA has been conducting in the Western U.S. with servers located in San Jose, California, GRID looks like it might be the first service to actually deliver on the promise of being able to stream your games over the net to a device that it could never be run on locally with good quality and minimal input lag. The service currently has over 20 AAA titles, including Batman Arkham City, Borderlands 2, and Psychonauts, with NVIDIA committing to add new games every week. After conducting their beta in California, NVIDIA seems ready to begin expanding the service to other places around the world. The service will be available in North America by the end of this month, in Western Europe in December, and in Asia during the second quarter of 2015. It will be available on the SHIELD Tablet and original SHIELD portable, and best of all, until June 30, 2015 it will be available for free. I've had my eye on it too, I wanna get a new tablet for my mother to replace her aging OG ASUS Transformer... Kinda waiting for the Nexus 9 review from Anandtech, I think it's a little overpriced and the build quality seems disappointing for the price but I think my mom would actually really like the 4:3 aspect ratio. "...recent 970 and 980 buyers were able to get in on the Pick Your Path bundles." There isn't anything official; however, Newegg, in particular, has been rather kind by (usually) giving a code to customers who purchased an applicable product within the past 30 days. Wouldn't it have been awesome if Nvidia could have released this as a Windows tablet? Every time any Shield anything gets announced it's the same thing for me...cool hardware, but I sure wish it ran Windows.